The ETCON WL140 quickly measures any reel of wire from 24 AWG to 1000 MCM gauge stranded and solid in lengths of 15’ to 20,000’. 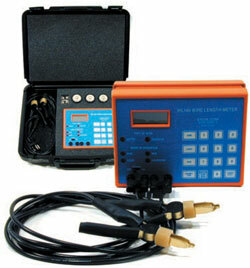 The unit is useful for electrical contractors, utilities and distributors for determining inventories of wire. The operator selects gauge, aught or MCM mode, selects copper or aluminum mode, attaches the alligator clips to the end of the wire being measured and presses "LENGTH" button to determine the length of wire. Microprocessor based meter designed to an accuracy of + or - 2% with 4 1/2 digit LCD readout. Direct readout for both copper and aluminum wire. Automatic internal adjustment for ambient temperature. Unique calibration mode enables measurement of non-standard gauge wire. Only one alligator clip attachment required at each end of wire. Insulation-piercing probe assemblies are included enabling use without stripping insulation. Impact resistant carrying case, alligator clip assemblies, insulation-piercing assemblies, batteries and new probe leads included.